May is one of the best seasons to visit Budapest to avoid the crowds of summer tourists and to enjoy nice spring days in Budapest (although there is no guarantee for rain free days). There are many festivals, several of which moves to the breezy open-air all around Budapest. May Day Budapest: May 1 is Labour Day, Hungarian National Holiday. Despite being a bank holiday all the museums and baths in Budapest, are open. To boot, there are various Majalis (May Day) Parties, open air concerts, etc. in the big parks of the city of Budapest. For a city central event go to Elisabeth square (by Deak square), or for bigger festivities join the crowds in the City Park or on Margaret Island. Foodies are not the only visitors of this gastro festival. Eating hand made cheeses, drinking quality house wines and craft beers, tasting jams and honeys made with love appeal to many visitors. Eat, drink and be merry in gourmet style in this open air event in Budapest. This art festival is called the Falk Art Forum and usually takes place in May. There are dozens of antique galleries and art galleries participating in this artsy event. Moreover, you can enjoy some concerts in the streets and galleries (jazz, blues, classical, etc. ), presentations of art historians, guided art tours, etc. The Falk Art Forum festival is a real treat for high art lovers interested in the Eastern and Central European arts. Venue: LOFFICE, city center District V.
Pricey entry to TedxDanubia could bring you together with forward thinkers in Hungary if you wish to have some business / science networking with Hungarian and Central Eastern European folks. TedxDanubia is usually an event which is easily sold out, so hurry up to get your entry to the talks. The underground and alternative cartoon festival is in a cool venue in Budapest, Durer Kert Cafe near the City Park, attracting the fans of comics and comic novels. Szekelys are visiting the Millenaris Park in Budapest to showcase their special cultural and culinary heritage. Enjoy the music, the tastes, the dances of Szeklerland (Szekelyfold) (on the map of Romania since 1920). The festival is focusing on the Szekelys’ heritage, as part of a Hungarian subgroup of the Magyar people living on in a mixed ethnic context of Hungarians and Romanians. May Festivals in Budapest: see more festivals going on in the city of Budapest in May. There are specialty festivals you may like, we have only picked a few of the most popular or unique festivals. Budapest in May will offer several classical concerts. Check them out on Budapest May Concerts. See the May schedule, booking info and general pool party FAQ for Szechenyi Bath Parties. Discover the nightlife of Budapest and the famous ruin bars on a Ruin Bar Crawl. Admire the sights of Budapest from the river Danube. 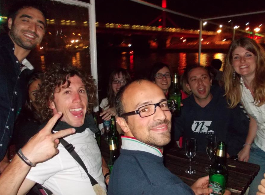 Wide range of Budapest Dinner Cruises are available to book, don’t hesitate to reserve your places in advance! The Spring Cruise Calendar is also full of great cruises, should you wish to book a simple sightseeing cruise or a Cocktail Cruise or Wine Cruise, just to mention some of the most popular programs. Discover beautiful Budapest attractions on a fun Budapest Segway Tour or visit the Buda Castle Hill and look down the breathtaking panorama of the city on a Buda Castle Guided Tour. The Great Market Hall of Budapest offers some nice programs in May on their May National Days of Great Market Hall. Are you interested in learning more about the traditional Hungarian foods and drinks, and do you wish to taste them? Why not book a Guided Budapest Market Hall Tour? 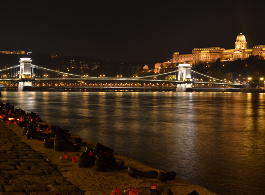 Top Budapest Event Calendar or the Budapest Event Guide: click to see the currently highlighted events in Budapest in May this year.